The biggest and most efficiently organised Defence and Homeland Security show in Asia is back to mark its 17th edition. 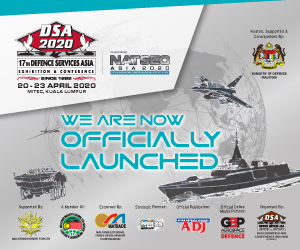 Defence Services Asia Exhibition and Conference (DSA 2020) held alongside NATSEC (National Security – covering Law Enforcement, Public Security, Border Control) will take place from 20 - 23 April 2020 at Malaysia International Trade and Exhibition Centre (MITEC) in Kuala Lumpur. With 30 years experience in defence and homeland security showcase, this event will bring some of the world’s most advanced technologies, systems, hardware and electronic warfare that the market has to offer. DSA 2020 and NATSEC Asia 2020 were officially launched on 28th March 2019 at LIMA in Langkawi by YB Mohamad Sabu, the Minister of Defence Malaysia. It is fully supported by the Malaysian Ministry of Defence and the Malaysian Ministry of Home Affairs respectively. Both shows will build on the resounding success of DSA 2018 and NATSEC Asia 2018 which raised the bar in terms of exhibitors, International Pavilions, VIP delegations and visitors. The minister later received participation contracts from industry players, signifying their commitment of participation at DSA 2020. Hosting the event was Tan Sri Asmat Kamaludin, Chairman of DSA Exhibition and Conference Sdn Bhd, which is the organiser of the DSA and NATSEC Asia series. Copyright 2013-2018 © Defence Services Asia. All right reserved.